The Grand Canyon is one of North America's most spectacular geologic features. 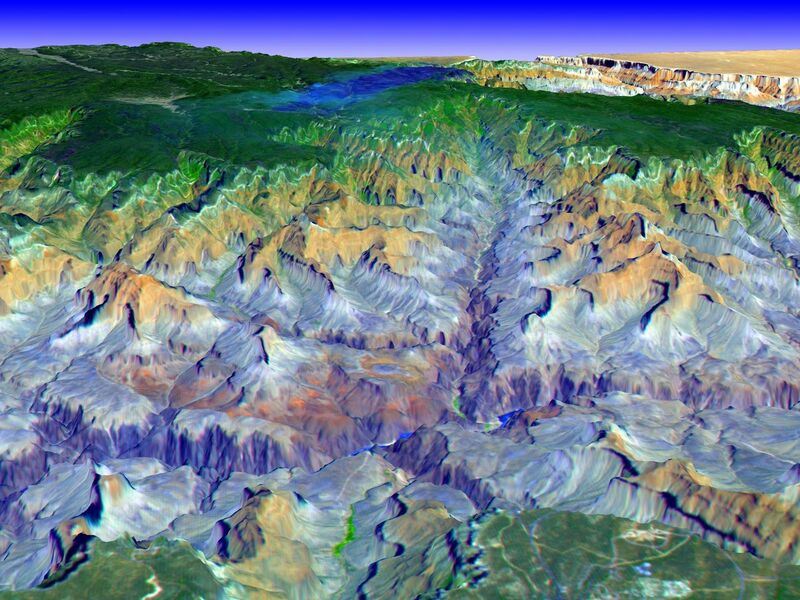 Carved primarily by the Colorado River over the past six million years, the canyon sports vertical drops of 5,000 feet and spans a 445-kilometer-long stretch of Arizona desert. The strata along the steep walls of the canyon form a record of geologic time from the Paleozoic Era (250 million years ago) to the Precambrian (1.7 billion years ago). The above view was acquired by the Advanced Spaceborne Thermal Emission and Reflection Radiometer (ASTER) instrument aboard the Terra spacecraft. Visible and near infrared data were combined to form an image that simulates the natural colors of water and vegetation. Rock colors, however, are not accurate. 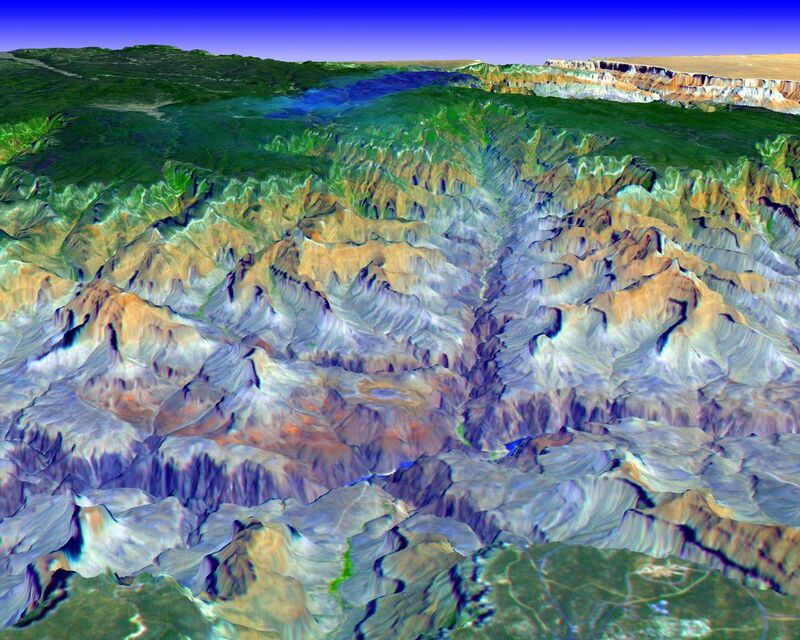 The image data were combined with elevation data to produce this perspective view, with no vertical exaggeration, looking from above the South Rim up Bright Angel Canyon towards the North Rim. The light lines on the plateau at lower right are the roads around the Canyon View Information Plaza. 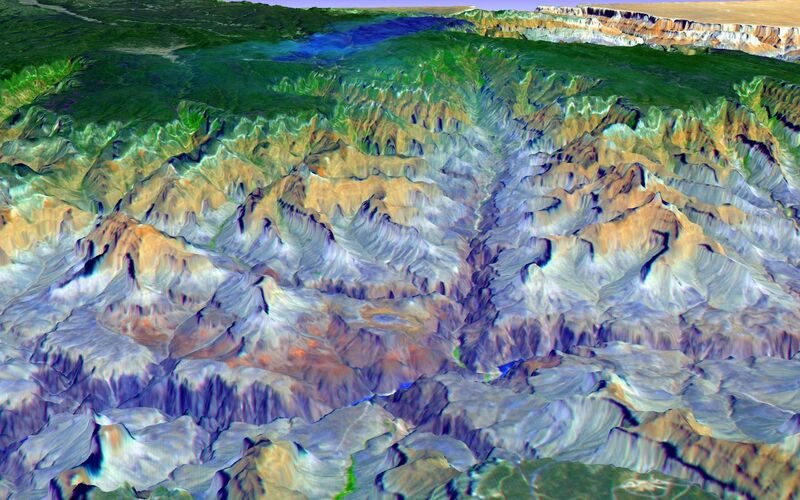 The Bright Angel Trail, which reaches the Colorado in 11.3 kilometers, can be seen dropping into the canyon over Plateau Point at bottom center. The blue and black areas on the North Rim indicate a forest fire that was smoldering as the data were acquired on May 12, 2000.